For applications that require a wear resistant and an electrically conductive tip we recommend this type. 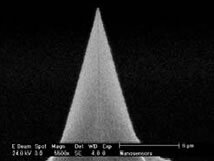 Some applications are Tunneling AFM and Scanning Capacitance Microscopy (SCM). 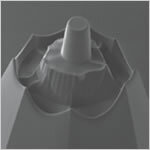 The CDT Diamond Coating is slightly doped and the total resistance measured in contact to a platinium surface is < 10 kOhm.